Nepal is special. Its home to the world’s highest peak, clusters of Himalayan ranges and the hard working people who live amongst them. Collectively, they have inspired, challenged and brought positive change for travellers from around the globe who seek to experience Nepal’s majesty and the warmth of the mountain villagers, but now, more than ever, they need something back from us. Tourism is the single largest industry in Nepal. From employees of its busy airline industry to the small Sherpa trader selling handicrafts alongside a trekking trail, almost every Nepalese benefits from tourism. An earthquake is something that the country will and can recover from. However, if there were to be a sizeable decline in tourism numbers to the country post monsoon (from September onwards) the knock on effect of a major economic crisis would have an even greater catastrophic effect for the nation. WILL IT BE SAFE TO TRAVEL TO NEPAL POST MONSOON? We are confident that trekking and travel in Nepal will be safe when the tourism season resumes in September. The safety of our travellers and staff is our number one concern and an ongoing review of all trekking regions leading up to the season opening will focus solely on that. Immediately after the earthquakes of 25 April and 12 May, trips about to depart could not be operated because workers across the country temporarily left their workplaces to be with and assist their families in their mountain villages. Internal flights had few pilots or crew, hotels were seriously short staffed and many who were unaffected were assisting with the relief effort. Emergency services were deployed for surveillance and rescue operations. These are characteristic of the first wave of response to a natural disaster of this scale. That phase has passed. The focus now turns to rebuilding damaged infrastructure and people getting back to their lives. All the international hotels in Kathmandu and in the larger cities are now functional and operating normally. Large numbers of people who left Kathmandu after the earthquake have returned to their work places. Schools and universities are generally now all open. The international and domestic airports are functioning normally. The large hospitals in Kathmandu which were initially overwhelmed with patients have worked through the emergency response and have now recommenced regular out-patient services while all the general surgical units have become functional. The CIWEC Medical Clinics in Kathmandu and Pokhara are open and running as usual. Various mountain regions across Nepal have been affected quite badly with heavy human casualties, destruction of homes and schools and decimation of crops. The lower Langtang and Helambu were possibly the worst hit regions. Others have escaped the impact of the earthquake with very little major damage. The majority of the World Youth Adventures treks take place in the Everest (Khumbu) and Annapurna regions, both of which escaped major damage. The Solu Khumbu (in the lower Khumbu Everest region south of Lukla) was affected but it is important to know that the Upper Khumbu which is from Lukla and north was not. All of our treks into the Everest region commence from Lukla and head north. The main trails in the Annapurna and Everest regions are continually in use by local people as well as the end of season trekkers since the earthquakes. Bridges on the main trails in these two regions are all intact. Some lodges in the Everest region have been damaged but building materials are already being flown in and local labour organized to restore them. All our permanent campsites in both regions, with exception of two of the Everest camps, were not affected. The two that were damaged have repair work scheduled in the next few weeks. Our guides are in the field now conducting a complete audit of all the trail conditions, bridges and infrastructure in these two specific regions, also checking the arterial areas. Thereafter, all other trekking areas in which our company conducts treks will also be carefully assessed including Manaslu, Makalu, Mustang, Dolpo, Kanchenjunga, Rolwaling, Upper Langtang and others. We will provide updates as soon as we have completed our surveys. Between now and September, we’ll also be consulting with a range of organisations, including the Department of Foreign Affairs and Trade and expert seismologists to establish the country is safe. Donate – There are numerous charities you can donate to. WYA encourages those wishing to make a tax deductable donation can do so through the World Expeditions Foundation and its Earthquake Appeal Fund. 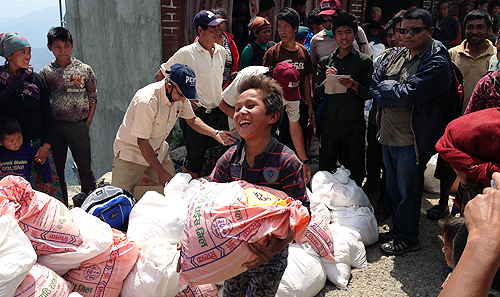 The Foundation responded quickly with the deployment of food drops to the hardest hit villages north of Kathmandu in the two weeks following the earthquake. This included 1000s of kgs of rice, lentils, cooking oil, sugar and salt for over 4500 households thanks to initial donations. With its strong focus on supporting education, it’s mid to longer term plans will be to help restored badly damaged schools so that young people living in mountain villages can return to receiving their education. – The earthquakes that struck Nepal on 25 April and 12 May occurred at a time when the major trekking season was nearing an end in the lead up to the monsoon. It is expected that the rebuild over the coming 5 months will restore essential infrastructure so that travellers can be confident that Nepal will be ready once again to welcome trekkers when the new season gets underway in mid September. Nepal’s economy is intrinsically reliant on tourism and we appeal to travellers to continue supporting the country by travelling to this wonderful Himalayan destination when the new season resumes. Our advocacy for supporting a return to Nepal is without commercial bias. We are committed to doing all we can to ensure that Nepal does not suffer a further crisis caused by an economic downturn that ha the potential to affect millions of people. Help a community project – one of the most selfless donations you can give is a day of your time. If your school is already travelling, consider swapping a day of the trail or sightseeing with an extra day helping repair a school in need. We have been in contact with most of the schools we have conducted projects in throughout the Annapurna region and fortunately they have only had minor damage. We are looking at schools in Gorkha, Dhading, Rasuwa, Nuwakot, Kavre and Sindhupalchok where there is heavy damage to the schools. WILL I BE A BURDEN? Quite to the contrary. Many Nepalese rely upon tourism to supplement the income they earn through subsistence farming while others are wholly reliant on tourism income. The people of Nepal need tourism employment. The roads to and from India are open and supplies to Nepal, as is the norm, mean that the supermarkets in Nepal are fully stocked. There are currently no shortages, nor is it considered there will be leading up to the new season. Nepal’s tourism infrastructure will be ready for the typically busiest trekking time of the year. 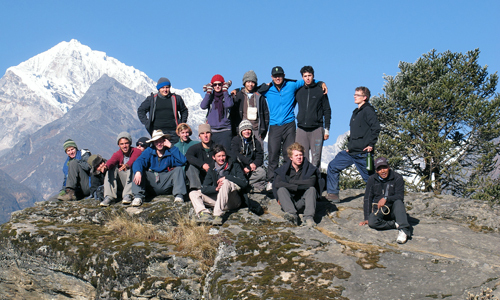 World Youth Adventures treks run in a self sufficient manner. We stock up on supplies for the trekking days from the city. Our private permanent and wilderness camps are not taking away shelter from others. The staff we employ are well looked after. Learn more about our Responsible Travel policies in Nepal. Please stay in touch and contact your consultant if you have any concerns or would like to ask specific questions about the recovery process, safety matters or preparing for your trek ahead. ‘Is it safe to travel in Nepal? The short answer is yes, it is very safe in fact. Nepal feels safer than most other countries around the globe, possibly due to the religious nature of the people and their natural kindness. Over the past 10 years Nepal has enjoyed a growing fascination to visit from travelers from all over the world. The People are very hospitable. The Nepalese accept that tourism is a mainstay of the economy, and are very welcoming. This applies to all sections and political groups: even during the Maoist hostilities of the early 21st century there were very few cases of any hostility towards visitors and the Maoist-led government declared 2011 to be ‘Visit Nepal Year’. Skyline Treks & Expedition offer best and memorable trekking holidays in the lifetime for all our most valuable clients. In Nepal there is much kind of standard Hotels. You have a lot of choices for your staying there, which is depending on your trips budgets. Of course, there are international standard Hotels, Golf courses. Recently, their economic is booming rapidly every year you can see many changes around cities. By 2018 they will have two more international chain Hotels (Marriott & Sheraton) in Kathmandu. And two other international Airports are under construction which will be complete by 2018 as well. Nepal is comfortable and fully safe destination for all nationalities in the World.